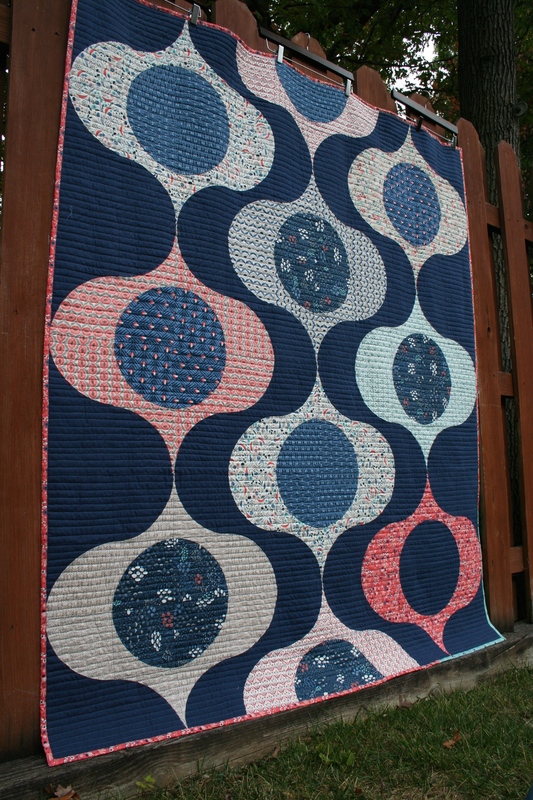 In the summer I was inspired to design a quilt using all curves, and I’m so proud and excited that it came to exist in the real world. I’m calling it Trill, after the wobbly notes of a bird’s call. 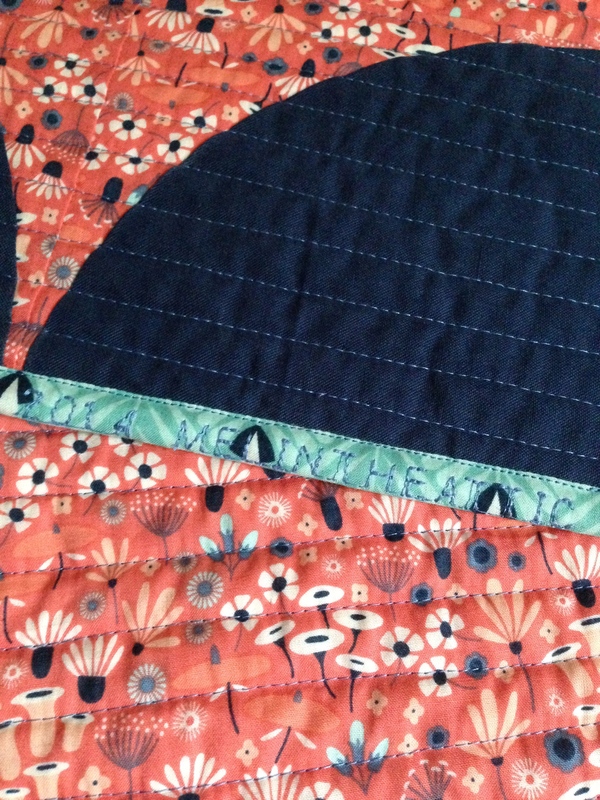 I thought it suited both the design and the fabric, Wildwood by Elizabeth Olwen for Cloud 9. I used the collection with Cirrus Solids in Ocean, my favorite navy blue of the moment. 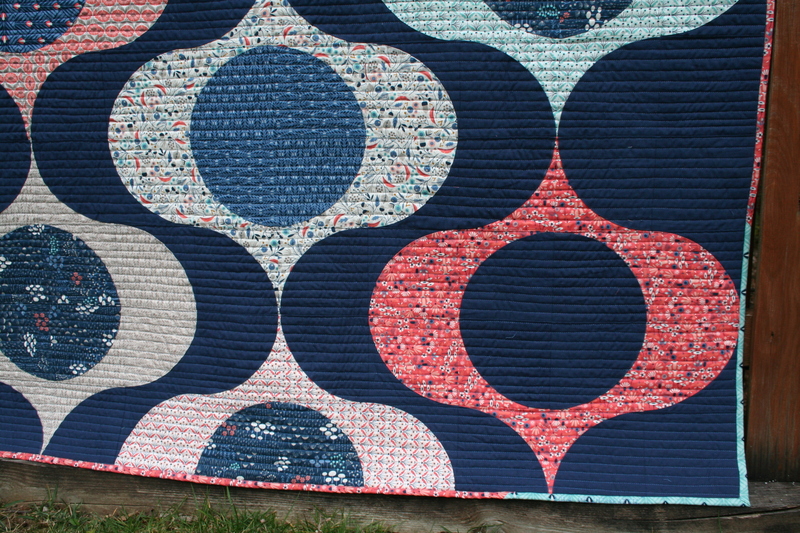 I think one of my favorite things about this quilt is the secondary squiggle between the prints. The design is actually made of just one block with different rotation and fabric placement. I’m writing a pattern for it this month and I’ll definitely keep you updated throughout the process. I can’t wait to see how someone else would interpret it– between the circles and pointed shapes and the background there are a lot of possibilities for change and movement. There were two prints in the collection– one a vibrant coral, the other bright teal– that didn’t quite fall into the categories of blue or white-based print. So I made the coral the focal point and put Ocean in the center, framing it with teal in the binding. The final size is 57″ x 69,” perfect for a couch throw. 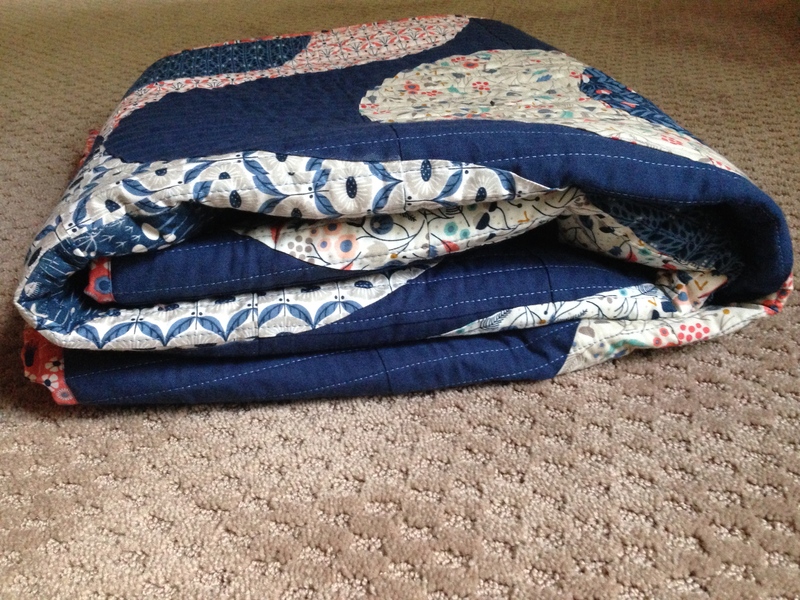 I love the drape that the quilting gives it, and it crinkled nicely after a wash. I’ll get to snuggle it after a little trip to Quilt Market, where it’s going to hang out with Elizabeth Olwen herself along with the rest of the fabulous Cloud 9 team. Absolutey magnificent, Melanie! I love this quilt. Loved seeing it progress along the way. Beautiful pattern for beautiful fabric! Brava! That squiggle is so amazing! I’d love to help you test (especially if there’s a small/baby version). I totally want to use Jessica Levitt’s new Cascade fabric. It’s beautiful, and I love the corner detail on the binding. But there’s no way on earth I’d inflict a whole quilt of pieced curves on myself, so I shall content myself with admiring yours! Thank you, Kate! They’re just gradual curves! But I felt the same way once upon a time. I think I caught a curves bug or something. So utterly gorgeous!!! And you make me brave with all those curves. Will definitely try the pattern. And the embroidered label is downright brilliant! Such a sweet quilt! It looks so cozy, I love the colors and fabrics you chose, they work so well with your pattern! Don’t ya just love it when comments you make on blogs disappear?!! Anyway, I just wanted you to know that I think this is brilliant. The way the thin pointy sections meet must’ve been hard work but so worth it. It really sets a standard for modern patchwork design. Great graphic punch for showing Elizabeth’s fabrics! I love how you made them stand out. I want this pattern! Have a blast seeing this at Quilt Market. 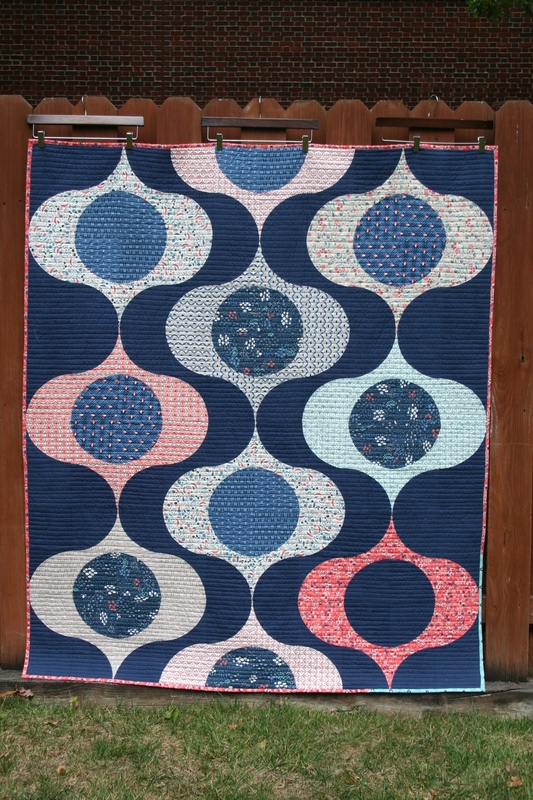 This quilt will be sure to grab attention! So excited that I got to see this one in progress. It came out great!! 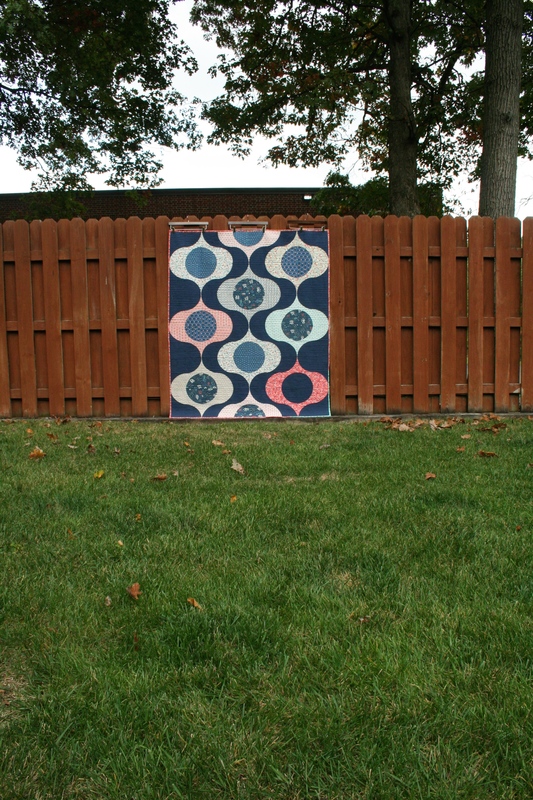 I love this quilt cant wait for a pattern!